InboxPays.com Reviews - Legit or Scam? InboxPays.com Reviews – Legit or Scam? 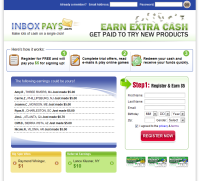 InboxPays.com is a relatively new website that promises you can earn money by participating in market research. Besides paid surveys, they also advertise that you will be paid for reading emails and for completing trial offers. Paid surveys is a very common way of making money online. When you first sign up with any of these market research opportunities, you must fill out a very specific questionnaire with all of you information. This information is then used to make sure that you qualify for the appropriate surveys and trial offers. It is important that you be as honest as possible when filling out this questionnaire because you could waste a lot of time being told you don’t qualify for surveys you have already begun. Inboxpays.com also encourages you to complete trial offers – and you are reminded that you are responsible for canceling those trial offers before you begin being charged – as well as reading emails and referring your friends to join their site. So is Inbox Pays a Scam? Well, the first question I always ask is whether or not the site charges you to become a member? Inbox Pays is completely free to join, so that’s a good sign. However, there are a couple things worth mentioning about the site before anyone signs up. First of all, you must have a PayPal account in order to get paid. This means that Inbox Pays deals in real currency instead of gift cards and prizes, which is something many people like. However, they require that you earn at least $50 in your account before you can request a payout. This is nearly twice the earnings amount required by most other paid survey sites. The truth is that each survey you successful complete generally won’t pay more than five dollars at the most, and successfully completing surveys is not the easiest thing. This means that you may have to complete many surveys before you can receive a payout, and some people may get frustrated and quit without ever receiving the money they have earned. In addition, their promise of getting paid for reading emails actually means getting paid to click the links of advertisers that they will send you. And once you allow them to give your email to advertisers, watch out. You will likely be drowning in emails. And the price that is paid per click will often be very low, and paid to Inbox Pays, who will then pay you a percentage of it. This makes the $50 payout look even harder to achieve. In general, Inbox Pays is free to sign up for, so it’s not a scam, but you should be aware of what you are getting into. Remember, if you’re really looking to make money taking surveys, then make sure to sign up for multiple companies in order to increase your chances of success. Average Rating for " Inbox Pays " is 1.53 out of 5 based on 136 reviews. Once you request payment then you need to send an email to customer care then within 48 hours they call or send email. They pay 100%. It is not scam. Only thing it takes times at least 30 days after the payment request. It was fine until I made to $48.70 in my account. Then all of a sudden it just stop giving me credit for all my emails read. I know I made well over $50. When I tried to contact them and inform them of this, I got no response back, whatsoever. This is POOR CUSTOMER SERVICE. This internet site is a SCAM. It needs to be shut down. It was fine until I made to $48.70 in my account. Then all of a sudden it just stop giving me credit for all my emails read. I know i made well over the $50. When I tried to contact them and inform them, I got no response back, whatsoever. This is POOR CUSTOMER SERVICE. This internet site is a SCAM. It needs to be shut down. I've reached their $50.00 mark plus more months ago. I request to be paid; they never did pay. Inboxpays DOES NOT PAY; IT'S A SCAM!! InboxPays does pay. I just received my first payment from them today. Sorry if I said they don’t pay and that it’s a scam. Well i finally got to the 50.00 mark requested a pay out. which they send payment to paypal and then they send you the money. this is such a rip off. not only do you have to wait until you reach 50.00 then you have to wait until they verify it by calling you to make sure you requested it. then you have to wait for 30 days until they send it to pay pal.and wait another 30 days inbox pays the 1st and the 30th of the month so which you have to wait at least 30 days before you get your money not worth it. I've reviewed about $150.00 worth of their b.s over 4 or 5 months time and they've only cleared about $12.00 worth of crap, so i cant get paid! You need at least $20.00 to be cleared to collect a check of any kind, well I'm waiting and waiting and waiting, to get paid any money at all!!! well it's fine until you get to the $50.00, then it keeps asking you to authenticate your account and it does not work. there is no legit email that you contact to get help.